Oral Allergy Syndrome : Are You Allergic to Fruits and Vegetables? 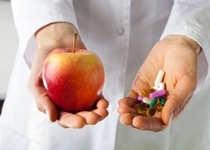 Home » Food and Nutrition » Are You Allergic to Fruits and Vegetables? Are You Allergic to Fruits and Vegetables? The go-to health advice for almost every health and nutritional practitioner suggests that a diet should simply contain an abundance of fruits and vegetables. That’s pretty good advice, especially for the average American who eats a lot of takeout, empty calories, and processed foods. The addition of more fruits and vegetables is a good start—don’t get me wrong. But what if some of these veggies and fruits are core contributors to your health issues? Are You Sensitive to Fruits and Veggies? People often crave their poisons. A diet high in processed foods may be harmful over time; however, certain foods may be destructive to your health all the time. Gluten, wheat, and dairy are main food sensitivities that may cause reactions. But can healthy fruits and vegetables also lead to food sensitivities? Yes, it’s true. For example, a food sensitivity test last year revealed my friend had a severe sensitivity to tomatoes, and moderate reactions to oranges, melon, blueberries, and dates. For years, he thought his diet was clean with healthy vegetables and fruits, and yet, these foods contributed to his digestive issues like bloating, gas, heartburn, and constipation. Your digestion is only one possible reaction. Other concerns may also include headaches, immune issues, heart or lung problems, muscle pain, fatigue, or emotional and mental symptoms. In fact, your midnight food cravings could actually be a symptom of the “healthy” vegetable you ate at dinner. Why Are You Allergic to Produce? Another possible sensitivity reaction is the most common: skin reactions. Allergies are often associated with skin rashes and conditions, such as eczema, hives, and psoriasis. Could your favorite red Gala apple be the culprit behind your unexpected breakout? Your allergic reaction may be related to pesticides or genetically modified vegetables and fruits. The “Roundup” herbicide glyphosate is often connected with the use of genetically modified crops. Bacillus thuringiensis (Bt) toxin is another common pesticide that may produce allergic reactions. Corn, papayas, peas, and tomatoes are common GMO fruits and vegetables. I also recall a study in which researchers found that pesticides from fruits and vegetables lead to allergic conditions, such as eczema. The study observed 30 patients who consumed fruits and vegetables from local farmers and also experienced eczema on their hands, face, neck, and feet. Pesticide exposure was attributed to eczema in 10 patients. What is the solution? Organic fruits and vegetables are free of GMOs and synthetic pesticides, but organic produce may not always be the answer to your fruit or vegetable allergic reaction. You may be allergic to certain proteins found in vegetables and fruits. This is a condition known as oral allergy syndrome, or pollen-food syndrome. Common foods associated with the condition include apples, carrots, celery, cherries, tomatoes, kiwis, pears, plums, peaches, bananas, cucumbers, melons, oranges, and zucchini. There is no certainty with allergies or sensitivities to fruits or vegetables. Applied kinesiology and muscle testing can help you detect food sensitivities and other potential intolerances. A food elimination diet or ELISA (enzyme-linked immunosorbent assay) blood tests can also help you discover your allergies or sensitivities to fruits and vegetables. Having said that, not everyone is allergic to fruits and vegetables, so it’s always best to talk to a doctor or other health care professional before completely eliminating these healthy foods from your diet. “Oral Allergy Syndrome,” American College of Allergy, Asthma & Immunology web site; http://acaai.org/allergies/types/food-allergies/types-food-allergy/oral-allergy-syndrome, last accessed February 6, 2015. Raj, R., “The Weird Reason Some People Are Allergic to Fruits and Veggies,” Health web site, January 1, 2015; http://news.health.com/2015/01/01/mouth-itches-after-eating-produce-oral-allergy-syndrome/?utm_source=huffingtonpost.com&utm_medium=referral&utm_campaign=pubexchange_article. Smith, J.M., “Genetically Modified Foods Unsafe? GM Foods and Allergies,” Global Research web site, May 19, 2014; http://www.globalresearch.ca/genetically-modified-foods-unsafe-evidence-that-links-gm-foods-to-allergic-responses-mounts/7277, last accessed February 6, 2015. Verma, G., “Pesticide contact dermatitis in fruit and vegetable farmers of Himachal Pradesh (India),” Contact Dermatitis November 2007; 57(5): 316–320.